Without any doubts, the checkout experience is the most crucial aspect of any online store. How well it’s designed is directly related to the conversion of e-commerce website — the faster and more convenient your checkout form, the higher conversion rate you’ll get. 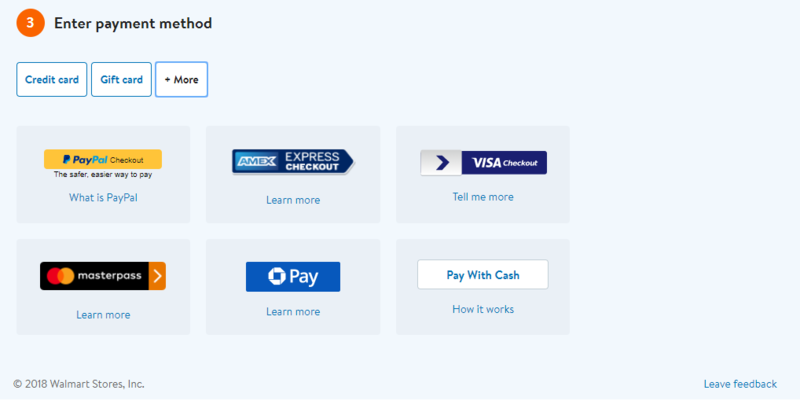 As a UX designer, it’s your job to ensure the checkout experience is seamless and efficient. In this article, I’ll share ten highly practical tips that will help you achieve excellent checkout performance. According to the Baymard Institute, a mandatory requirement for creating an account is one of the top reasons why people abandon the process of purchasing. Don’t make such mistake! Allow users to purchase without creating an account. 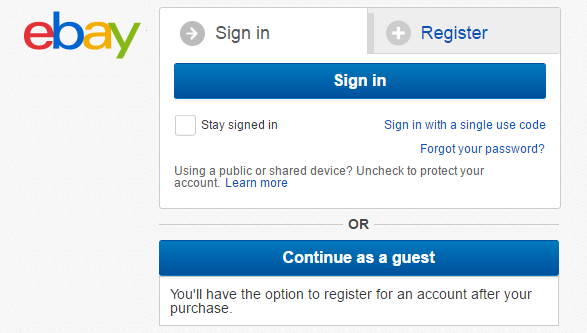 It’s essential not only to provide guest checkout option but also make it clearly visible. Baymard Institute found that 88% of mobile checkouts forms fail to make the guest checkout option clearly visible, so users often overlook it. When it comes to collecting information, “less is more” is the most important principle to follow. A study by Baymard Institute found that almost 1/3 of US online shoppers abandon their cards because of “too long/complicated checkout process.” The same study found that it’s possible to reduce the average checkout length by 20-60%. Thus, as a designer, you should always ask for a least possible amount of information. For instance, if you don’t plan to call your customers there’s no need to ask for their phone numbers. By reducing the total number of fields, you not only boost up the completion time, but you also make the process of competition much more comfortable. Less number of fields means less cognitive load on a user, and, as a result, less number of potential mistakes. Tip: Clearly mark all optional fields. If you have optional fields they should be marked with word ‘optional’ or ‘*’ symbol. 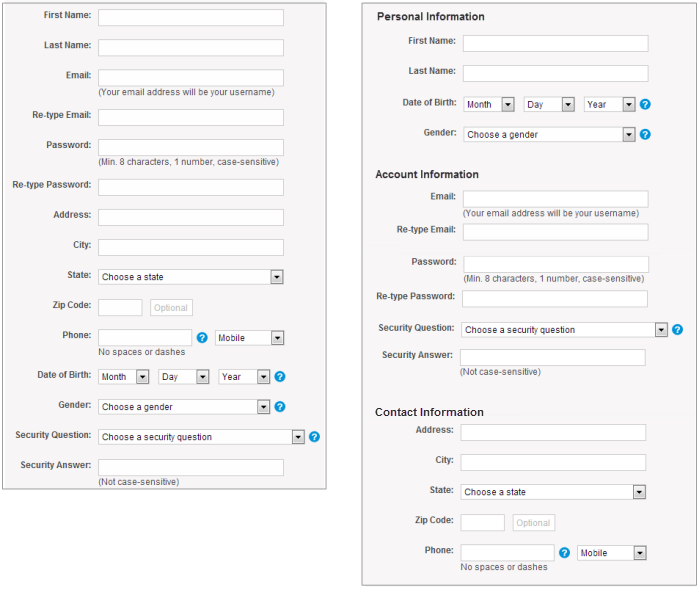 This will allow users who want to fill the form ASAP skip those fields. The main rule with labels is not to hide them while users input the data (users shouldn't lose the context). Field labels should be visible all the time; ideally, they should be located at the top or at the left of the field. If you design for mobile and have limited screen space, you can utilise a technique called floating labels. When users activate a field, a placeholder text fades out, and a top aligned label animates in. In multiple-column forms eyes follow zig-zag scanning and this makes it much harder for users to focus on certain elements (eyes won’t be fixated on certain elements). As a result, multi-column forms increase the completion time. When form consists of one-column, this makes it much easier for users to scan it — eyes follow a vertical scanning pattern. Chunking fields on the page. You can group relevant information together in chunks and put them in a logical order. Create multi-step checkout process. You can break checkout process into the number of separate steps. For example, a typical checkout flow can be presented as a 4-step process — customer information, shipping method, payment, order summary. 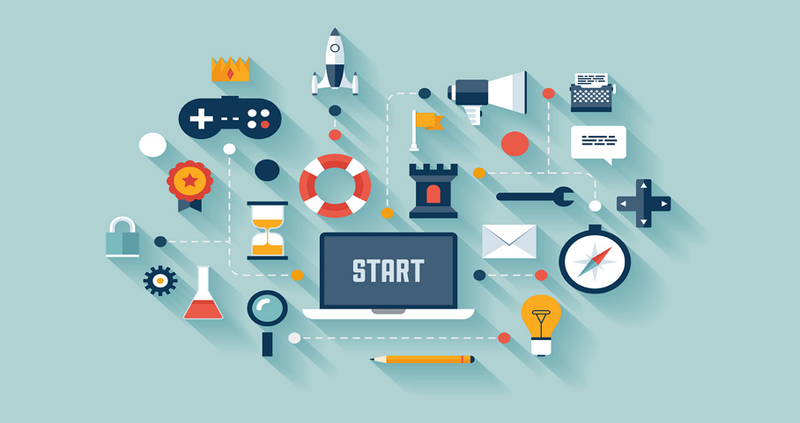 Breaking a big task into a few smaller tasks allow users to focus on one particular type of input at a time. But if you’ll use this approach, make sure the process of checkout is clearly visible. Users will need to understand how much time they’ll need to spend on the checkout process and it’s excellent when interface provides this information in an easy-to-understand format. 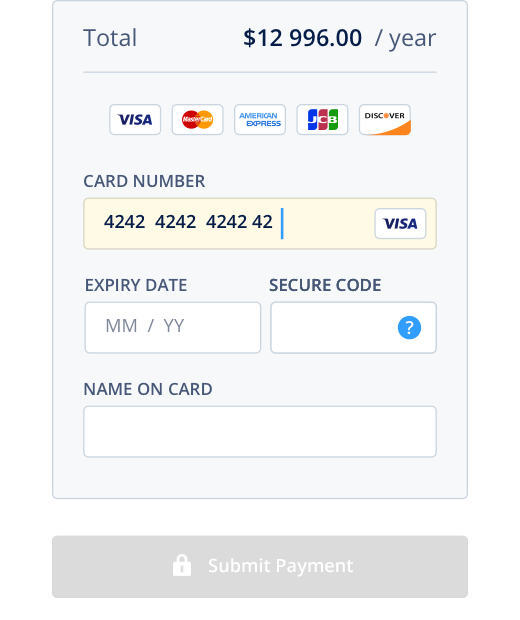 Tip: For multistep checkout process it’s essential to ensure that back button behaviour aligns with user expectations. Users expect the back button to take them one step back (to what they perceive to be their previous page) not all way back to the product page. The second behaviour often accompanied with data-loss and, as a consequence might easily cause checkout abandonment. Strive to minimise the need for typing. You can use a mechanism of auto-suggestions and auto-completion when users start typing an address. Services such asGoogle’s geolocation search allow you to fill the address based on a few typed in letters. At the same time, you should leave pre-filled fields editable so users can change information in them. Tip: The procedure of filling out the address might be even more straightforward on mobile. You can ask users for the permission to access their current location and feel the form for them. 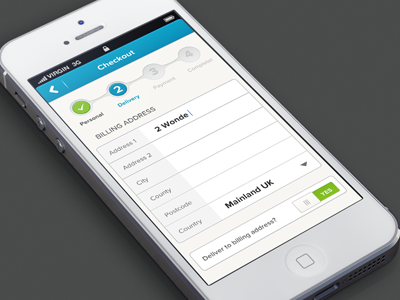 Provide as many options for payment as you possibly can so that users can choose their favourite methods. Walmart allows paying using a credit card, gift card, and many other popular options such as PayPal. Inform users about acceptable card types. You can provide this information as a line with icons of supported card issuers. If your payment system doesn’t support some type of cards, tell that to users as they start typing card number. Display the card type based on the first numbers that were entered. 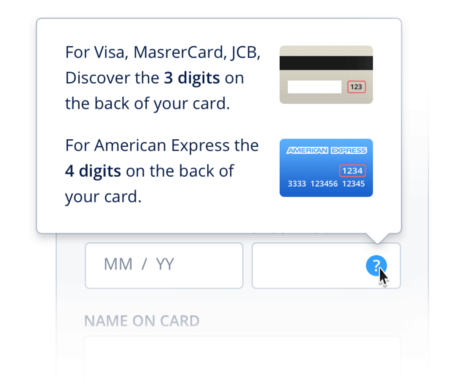 First six digits identify the exact issuer of user’s card. It’s also good to put the logo of card issuer on the field to give the user visual feedback that the system has identified his/her card. Use placeholder text for the card expiration date. This will help users to enter data in valid format. When you ask for the “security code”, provide a hint where customers can find it. This might be something as similar as ‘?’ Icon next to the field which shows a pop-up with information when users click/tap on it. Remember that “security code” isn’t unified — different card issuers use different naming, position, and length for it (e.g. security code for VISA is located at the back of the card and consists of three digits, while for AMEX it’s on the front and contains four digits). It’s essential to provide order summary before a purchase. This feature allows users to review the order details and selected option for delivery, double check the billing and shipping information and make all required corrections if necessary. Asos includes provides order summary: users can review and correct their orders. “Quick buy” is an excellent feature for returning customers. If your database has information about a customer, instead of asking them to proceed through all steps of the checkout process, this feature allows users to move straight to the purchase summary. All billing and shipping information will be used from a previous purchase. 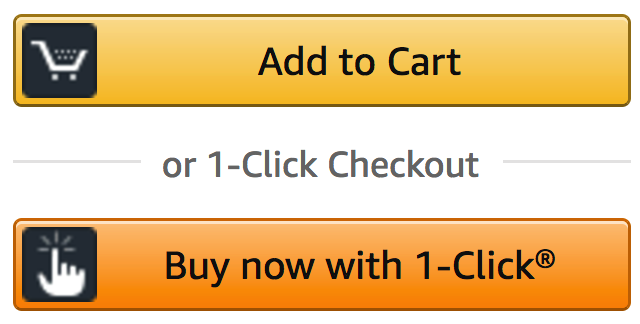 Amazon’s 1-Click purchase feature allows users to purchase the product almost immediately. Information about preferred shipping method, address, and payment details will be used from the customer’s data. When it comes to the checkout process, your ultimate goal is to increase success rate (make users convert) and decrease completion time (allow to do it faster). The easier it is to buy stuff, the better chance there is people will do that.